I Am Joaquin marked the emergence of film as a distinct cultural and aesthetic practice within the Chicano Movement. 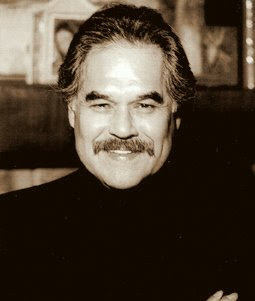 In the film, Luis Valdez gives a dramatic interpretation of Rodolfo 'Corky' González's epic poem of the same name. I Am Joaquin speaks of the struggles that the Chicano people have faced in trying to achieve economic justice and equal rights in the U.S.
Puerto Rico & Colombia - The World's Happiest Nations? According to the World Values Survey, Puerto Rico is the world's second happiest nation. Yes! The people of La Isla del Encanto are filled with alegria -- even though their island nation is a 'commonwealth' of the currently unhappy USA. Coming in third on the happy meter is Colombia. The photo above makes clear why the people of Puerto Rico are so smiley: they're actually Taíno gods and goddesses, catching rays and taking refreshing dips into the emerald green sea. And we know about Juanes, El Pibe, Shakira and Gabriel of Cartagena. What more proof do we need? American playwright, writer and film director Luis Valdez was the keynoter at the recent gathering of Latino independent filmmakers. A great teacher and storyteller, Valdez weaves into his talk personal biography, historical vignettes as well as lessons for young Latino filmmakers -- and he does so with warmth and humor. The introduction is by Moctesuma Esparza. From the migrant labor fields to Broadway, Luis Valdez remains true to his original vision... performance that addresses the Chicano experience in America in a context meaningful to all Americans. Valdez's credits include, founder & artistic director of the internationally renowned El Teatro Campesino, council member of the National Endowment of the Arts, and founding member of the California Arts Council. His awards include, Presidential Medal of the Arts, the prestigious Aguila Azteca Award, Governors Award of the California Arts Council. Valdez continues to work and mentor a new generation of theatre artists at El Teatro Campesino. 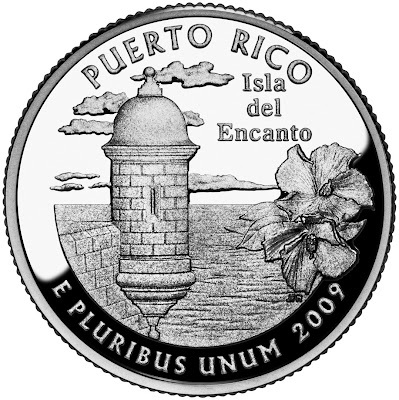 The U.S. Mint unveiled the first U.S. coin with an inscription in Spanish, a quarter honoring Puerto Rico as the "Isla del Encanto" — or "Island of Enchantment." This should set-off the English-only wingnuts on another round of Latino bashing. But hey, I'll gladly take as many of these lovely 'foreign' language coins as the cultural imperialists want to dump. 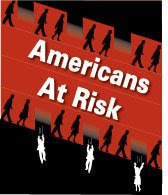 According to Americans at Risk: One in Three Uninsured, a new report from Families USA, a health advocacy organization, a staggering 86.7 million people were uninsured for some period of time during 2007-2008. Adding to the nation's dismal record in this critical public policy area are the huge disparities among ethnic groups. For example, a disturbing 25.8% of Whites were uninsured, but a truly shameful 40.3% of African Americans, and a beyond shameful 55.1% of Latinos, were uninsured. Oh...and some 80% of the uninsured were employed!